Tulsa City-County Library &Tulsa Historical Society. The Cartoon Hut at Sipes...seems like that thing almost never worked and we would just goof around inside it till the fateful day I slipped off one of the benches and split a lip. Mom banished us from that from then on...guess it's better than being banned from the Cains. Who remembers those Kiddie Movie Booths that were scattered around Tulsa in the 60's and 70s? 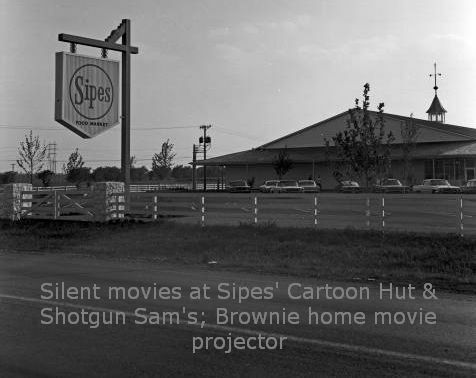 I remember the Sipes Grocery Store at 61st and Yale (the Holliday Hills addition) had one of those Kiddie Movie Booths, and whenever my mother did her grocery shopping, my brothers and I loved to go with her so we could get free coffee and sit and watch cartoons and the old silent black & white comedies. 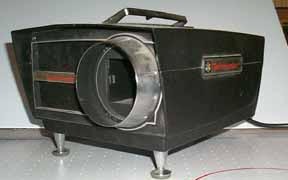 Those same films were also distributed to Shotgun Sam's Pizza Parlors and various other establishments and area restaurants in continuous loop super 8 cartridges that played on special Technicolor projectors. 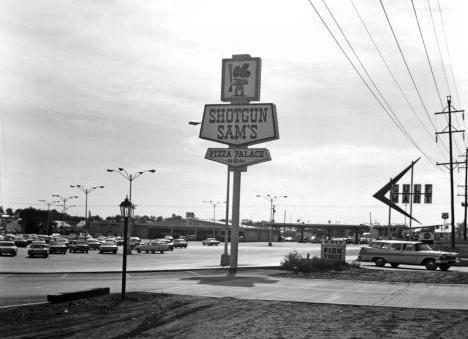 Shotgun Sam's & the Gulf Mart sign near 21st & Sheridan. Courtesy of Beryl Ford Collection/Rotary Club of Tulsa, Tulsa City-County Library & Tulsa Historical Society. 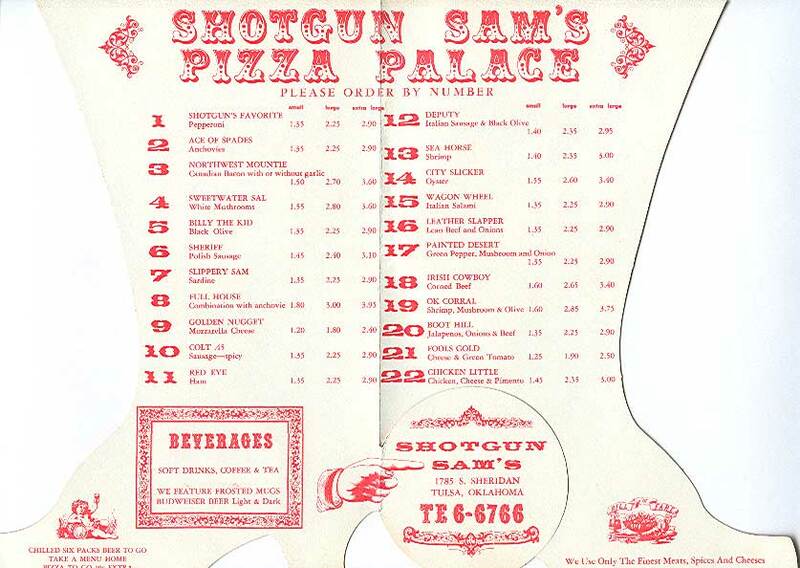 Click on the photo to see a Shotgun Sam's menu. From 1965 until 1971 our across the street neighbors were the Hobsons. Many of you know Jack Hobson who worked in Tulsa Television from the mid 70s through mid 80s. After the Hobson family moved the Dougherty family moved in and it turned out that Jerry Dougherty, the father, ran the business that distributed all those films throughout the city, out of his garage. 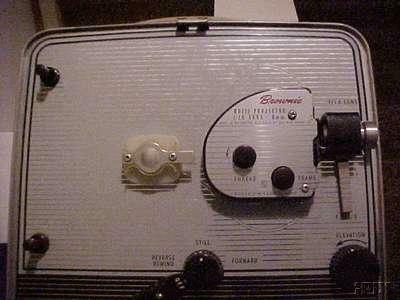 It wasn't long before Jerry found out I was into making 8mm movies and he offered me a job splicing the broken films. 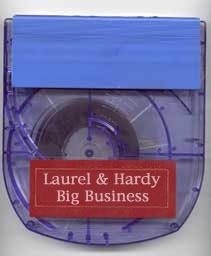 I got $5.00 per splice, and $10.00 per splice if I had to open the cartridges to fix them. That was some radical cash for a young teenager to be making, especially since those films broke constantly!!! Once I got my drivers license in 1974, I also began to go around picking up old movies and delivering new ones. 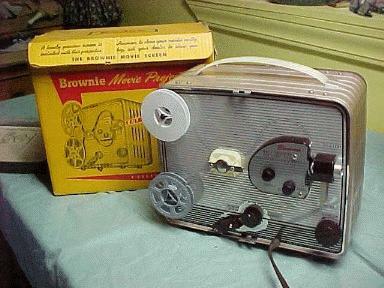 The fringe benefit from this job, besides the great pay, was I had a projector in my bedroom and a constant supply of my favorite films to watch and share with my brothers and friends. I truly came to appreciate and love the silent comedies, especially Laurel & Hardy. It was during this period when I began to see the Laurel & Hardy talkies on "Dr. Mazeppa Pompazoidi's Uncanny Film Festival And Camp Meeting" and my appreciation for Stan & Ollie grew even stronger!!! 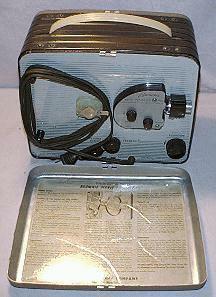 You might say that was when I began a career in the multimedia field that I still work in to this day!! 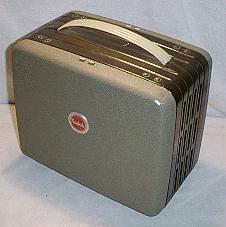 home projector in a loop.